Beeing a chemist I started pondering about whether it would be possible to mimic natural mineral waters by adding a clever cocktail of salts before carbonating the water. 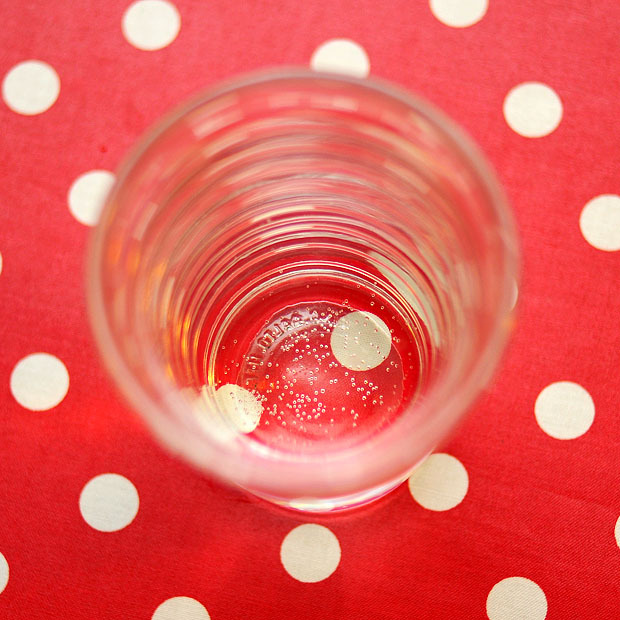 A real DIY mineral water if you like. The first thing a scientist does these days when a new idea strikes is to google it. I found simple instructions calling for addition of sodium bicarbonate, more elaborate recipes with magnesium sulfate, calcium chloride, potassium bicarbonate and sodium bicarbonate and a recipe for magnesium bicarbonate water where magnesium hydroxide is neutralized by the carbonic acid. But none of these were replicas of actual mineral waters. What I really was looking for was a calculator that would tell me which salts to add in order to clone a specific natural mineral water. But since I couldn’t find this I figured I would have to make my own. Websites such as Mineral waters have comprehensive listings of mineral contents of several hundred commercially available natural mineral waters from around the world. Major cations are calcium, magnesium, sodium and potassium. Major anions are bicarbonate, chloride and sulfate. In addition a number of trace minerals are present at lower concentrations. One thing I’ve wondered about is which ions contribute most to the taste. The fact that even low concentrations of manganese or iron give an unpleasant metallic taste suggests that the taste of cations is a function of concentration as well as their individual taste thresholds (just like with odorants!). But things are complicated by the fact that iron salts can induce olfactory sensations as well, possibly due to catalytic lipid oxidation. Unfortunately I haven’t found scientific papers on which cations/anions contribute to the desirable taste of mineral water (but please let me know if you know any!). Therefore, as a starting point I decided to begin with some well known mineral waters and assume that their mineral content is quite close to an “optimum”. Furthermore I decided to only focus on the the major cations and anions. When searching I got a number of hits in old German books such as íœber die Nachbildung der natí¼rlichen Heilquellen (1824) and Vollstí¤ndige Anleitung zur Fabrikation kí¼nstlicher Mineralwí¤sser (1860) which discuss how to prepare artificial mineral waters with elaborate descriptions of the the carbonation equipment. Sub sole nihil novi est. Germany has numerous spa towns (Ger. : Kurorte) were the local mineral water was (and is) claimed to have health benefits. In the 19th century some spa towns would evaporate their mineral water to yield the contained mineral salts as a dry residuce for the visitors to bring back home. There they could redissolve the minerals in water and enjoy the health benefits in the comfort of their own home. This recipe corresponds approximately to a water with the following mineral content (all numbers are mg/L): calcium 58, magnesium 32, sodium 232, bicarbonate 603, chloride 195, sulfate 11. The recipe specifically mentions that iron salts and silicates have been left out, and that the total salt concentration has been somewhat reduced compared to the actual mineral water in Selters. We can compare this with a contemporary analysis of Selters water (mg/L): calcium 110, magnesium 38, sodium 299, bicarbonate 850, chloride 269, sulfate 20. We see that the lower salt concentration claimed in the recipe above is actually true. Not bad considering that the recipe was from 1860! Oh – you may wonder if I’ve tried this? No – not yet. I’ve spent my time researching this, not testing it yet. But I will buy the required salts and report back! If you happen to have the pure salts available, why not give it a try? I am so excited that you posted this! I asked for (and got) a soda maker for Christmas and I agree, the carbonated water is nice but lacking something. I have been researching this a little and added a bit of calcium chloride to one bottle but then worried about killing myself with volatile salts. I am going to continue to experiment with your guidance. Thanks! Hi Martin! I have been thinking along the same lines as you, although I never ventured quite as far as you did. 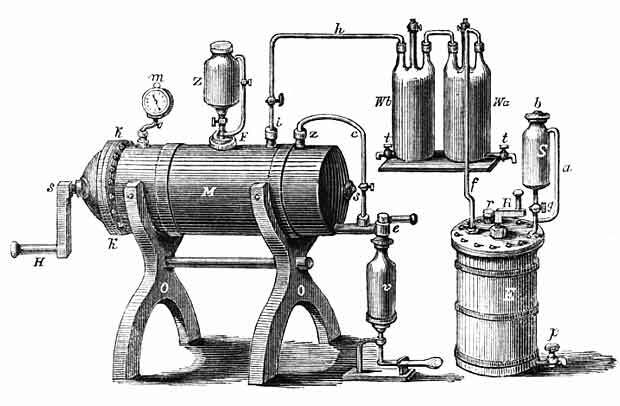 I simply took the list of “ingredients” from a bottle of Vittel, went into the lab with a calculator, a liter of distilled water and the necessary chemicals, and created my cocktail. It tasted reasonably similar to the original product, but obviously I didn’t drink any of it. I was interested in knowing how various minerals contribute to taste, but it seems to be a quite complex problem with lots of synergies involved. However, there is one ingredient missing from your list which seems to have a rather large impact on the taste: nitrate! With no nitrate present the water seems to get a very round, flat and fatty taste/feel to it. A few mg/L of nitrate will make the water taste more fresh and zippy (or something like that). If and when you start synthesizing your own mineral water, would you please test this hypothesis, and let me know if you reach the same conclusion? This is really interesting, and I like the calculator. If you have access to a good library, you might check out a few books on brewing. I know many brewery build waters from around the world from RO or distilled water for each batch. ‘Brewing techniques’ by George Fix might be a good place to start. ‘New Lager Brewing’ by George Noonan is another good one. It is information focused on brewing, but might provide some explanation of taste for the various salts. Matthieu: It seems to me that if the charges don’t balance in the analysis given, the gap is normally filled by bicarbonate. The principle in my calculator is that the calcium and magnesium hydroxides are neutralized by (excess) carbonic acid. I therefore assume that every OH- added is completely converted to HCO3-. If the total amount of carbon dioxide added is known (in g/L), one can arrive at an approximate pH by using the Henderson–Hasselbalch equation (aka the buffer equation) on [HCO3-]/[H2CO3]. But who knows if the gas/liquid equillibriums in the presence of all these salts play some other tricks at us? Jonas: When doing the quick calculations – did you have complete control of your anions? And how did you tackle bicarbonate/carbon dioxide? What solved this for me was to add calcium/magnesium both as sulfate and hydroxides, and the let the carbonic acid neutralize the hydroxides. Any how – very interesting that you bring up nitrate! Is this based on your own experience or have you also seen papers on this? I’ve noticed that the website Fine Waters introduces the term “virginality” to describe the nitrate content, but their approach is a purely negative one as they equal nitrate content with contamination from agriculture… But if I’m to include nitrate in the calculator – which cation ion should I choose? @ Matthieu: Did you consider the ions contributed by the self dissociation of water in your calculations? So your pH would be the -log [(H3O+ ions from your salts) + (10^-7 H3O+ ions from water)]. Thus no matter how much you dilute an acid, it’s pH would never cross 7. And the lower the concentration of the solvent, the greater the contribution of the dissociated water ions on the pH. But does the mineral content your tap water actually differ that much from natural mineral water? Thank you for creating the spreadsheet. However I was looking at one Mineral water – Ty Nant (comes in both still & Fizzy). The Mineral analysis also required the presence of Potassium and other compounds which I did not see in your list. Any Ideas on is this a case for MkII? Kurt: Yes, at least here in Norway were the water is very soft. Ca is typically 10-25 mg/L and Mg < 10 mg/L. John: When you write "require" it's true that one would require it if the goal was to create a true copy, but the questions is - does potassium at those low concentrations actually have any taste? To simplify things I actualy left potassium out as I haven't found any indications that the low levels contribute to the taste. But maybe I should include it? I have a draft edit where I included nitrate. Changing the taste of water is commonly done by beer brewers. I got a taste for real ale a year ago and last summer me and my wife had a week vacation in the UK. On our trip we came by Bury St. Edmunds and took a guided tour at the Greene King ale brewery. During the tour, the guide talked about ale making and the ingredients, all natural that makes good beer. However I couldn’t resist asking her about the sacks of sodium I saw on the floor. She then explained about something beer brewers call “Burtonisation” named after Burton on Trent (if I recall right). A lot of beer is brewed on license and the the local water must taste similar as the original used water. Greene King brews ale from other breweries and that’s why they must match the water taste of the original. BTW. Thank’s for being on Schrí¶dingers katt! I just started the kneel free bread. Can’t you tell NKR that your recipes should be easily found at NRK.no, it’s not! 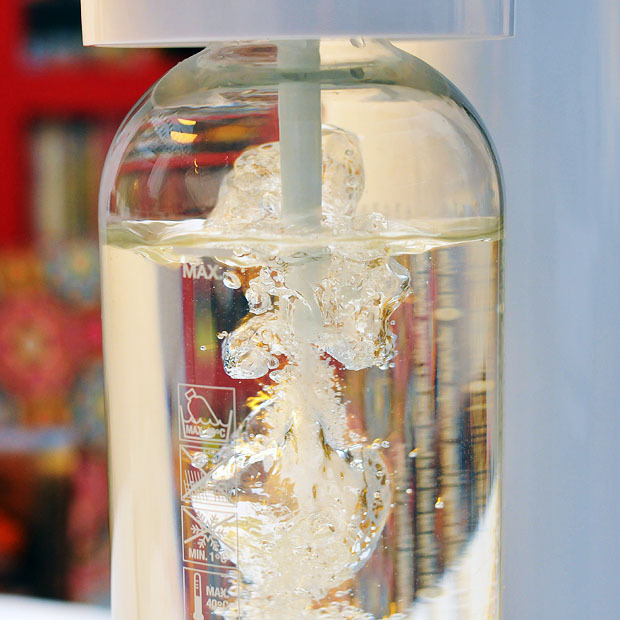 this makes fizzy water with a soda stream much more interesting! This sounds really interesting! I think you should start a company that sells DIY mineral water. Team up with a winemaker (or some such) and make several mineral waters that go particularly well with different wines or foods, perhaps? Or sell water mixes for beer breweries? Also, you could dramatically reduce the number of empty plastic bottles enormously, which generates way too much garbage all over the world. I got a soda stream for christmas and instead of filling up on pop I discovered how much I love carbonated water! Thanks for the post- now I know I’m not alone! Thank you so much for putting this together. I have come across allot of comments and posts about this issue, enough to prompt some ready mix to reflect the increasing awareness of the environmental impact of bottled water purchase (though the pressurised CO2 canisters have their own concerns). But this seems the most comprehensive. I have huge guilt over my mineral water consumption, but know that my addiction is to the salts, the carbonation is just a bonus. Like a sports drink without the sugar. I have been looking at getting a soda stream, but want to make sure I will be able to make the mineral water mix before I invest. I am in Australia, and our market is smaller, but can anyone tell me where I can get my hands on some sort of calcium salt (I see bryan mentions calcium acetate from eggshells…?) does any one know how do you make this or if there are any other options? I also note the Dasani disaster with bromate and am a bit concerned about unintended health outcomes of mixing and drinking salt mixes without lab testing the recipe yet. . . Those of you who are making and drinking these mixes, how what standards or tools are you using to make sure you are not mixing up a carcinogen?? I’ve cloned the Gerolsteiner, made a gallon this morning (to be charged a liter at a time in SodaStream bottles). My method was serial dilution, measuring 10 grams of each salt into a quart (32 ounces) of water for a 1.06% solution. 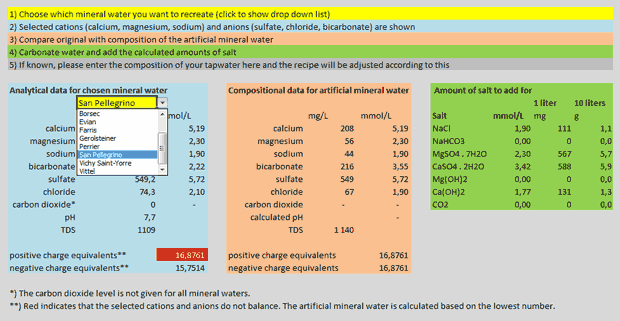 I used the bottom part of the spreadsheet to convert mg of each salt to fluid ounces of each solution. Following Darcy O’Neil’s (Fix the Pumps, author) advice, I added sodium salts first to avoid cloudiness. However, before carbonation, the water was cloudy. I charged and then returned the bottle to the fridge. 30 minutes later, I charged again. It was much clearer, but still a little hazy – but tastes great. Thank you for doing this! Paul: Thanks for the comment! I found your first blogpost on mineral waters the other day, but no easy way to contact you (comments required registration). Anyway – Thanks for mentioning the “Fix the pumps” book. The reason I wanted to contact you was to say that I’ve made an updated version of the spreadsheat available for download: http://bit.ly/eFp0C7 (i posted it on Twitter). It allows you to include/exclude potassium and nitrate. I also added the composition of a couple more mineral waters. Any feedback is greatly appreciated. I must admit though that I haven’t gotten around to try it yet. But I guess I would mix all the salts in the proper ratios and then weigh out the required amount of salt and add it to a bottle of cold carbonated water and quickly put on the cap. The other option would be to disperse/dissolve the salts first and then carbonate – not quite sure what would work best. Paul: With less accurate scales the trick is to make up a stock mixture of salt for 10 L or even 100 L water. This way there will be enough to weigh, even of the salts present at the lowest concentration. Good thing “Fix the Pumps” got mentioned. It’s a great book. I’ve got a bunch of old formularies and soda fountain books. They all have recipes for different mineral waters. Seems it was pretty common back in the day. Todd: If you have any suggestions on which salts would be easiest to use based on your old books I love to hear about it! I am not a chemist, though I took a couple of semesters in college, long ago. I have a question for someone more familiar with what happens to the salts when water is carbonated. I ask because the Gerolsteiner solution is great carbonated, but tastes really yucky if you drink it before carbonation. I nearly spit it out. I’ve also noticed a physical difference in O’Neil’s Seltzer formula and ordinary water when carbonated. The Seltzer takes more carbonation and the bubbles are larger and more pronounced. I’d appreciate any comments about this. Thanks, Paul. Another bit of practical advice: When carbonating mineral waters on the SodaStream, release the pressure a little at a time – like opening a bottle of soda water. You’ll have quite a mess to clean up if you release the pressure all at once, even though that is no problem with straight-up tap water or distilled water. Be forewarned! Thank you Martin for seeking your own path to understanding all component variables which combine to form the taste you wanted. I’m not a chemist, yet I’ve discovered the ultra-hard way that its the understanding of the chemistry of my flavors that I’ve been pursuing these last frustrating years. I should back up a bit & tell you I’ve started a beverage company that is built around one main drink that has a very distinct and unique flavoring. I made it naturally, but for the mass production I needed to duplicate it working with oleoresins and oils instead. Long story short, everything has been on hold b/c I am stuck determining how to properly heat the oleos to alter them to the exact ratio of compounds & byproducts necessary for the optimal taste I initially sought after. I need to have that result measured, then accurately replicated on a large scale. I’m in NYC, if you know of a better person thats in my vicinity to speak to about this, a recommendation would be most helpful! Ken: If I understand correctly the flavors are generated by the heating of the oils and oleoresins? If you aim to replicate a natural flavors by generating aroma compounds in such an “uncontrolled” way I think you are facing a difficult task! Martin, initially when I started seeking an oil or oleo that best matched the natural recipe, I discovered that the oils were lacking, and the oleos contained unwanted negative tastes within them. I tried many many samples too! Eventually I discovered that by chemically altering the compounds by increasing the heat and time of applied heat, I removed many of the unwanted extras, but also gained new properties, some good, some not so good. Yes, the task became monumental. I settled on a time and one heating method for now, but I’m merely accepting the new taste as is, while not knowing the % ratios of the new creation at all! I know there has to be a better way! My goal is to isolate and measure the totals of each part of what I have as it exists now, but then after that I *must* refine it to maximize its best qualities. Can you help me find the people or facilities or tools that will get me closer to my personal holy grail? For three generations, my ancestors were “mineral water manufacturers” in the east end of London ( c 1840—1900). Their premises were quite modest-but they seemed to have made a VERY good living out of it. We have no details or photos, unfortunately. I would welcome any ideas which may answer some questions. i.e.–what sort of process would have been used? ( bearing in mind the relatively limited size of their premises). Would the finished product have only been sold in small pressurised glass bottles?—-or would it have been sold in larger volume to wholesalers for re-bottling?—we can find no evidence of ANY “bottles” with their name on ( Bailey ). Their premises were a stable and a cellar in Armagh rd Bow ,London. Hope someone may be able to solve this for us. I have got magnesium sulfate and calcium carbonate. What happens if added with water and carbonted it with SodaStream? Is it like this: MgSO4 + H2O + CO2 + CaCO3 = ? Is it poison? In other words MgSO4 will just dissolve. CaCO3 has a very low solubility in water, but upon carbonation the formed carbonic acid (H2CO3, not shown in the formulas) will help dissolve the calcium carbonate. And no, it’s not poisonous.